The holidays are upon us and everything is sparkling. The trees, the snow on the ground and our loved one’s eyes are all sparkling with the light of the season. But the most exciting place for sparkle, when you’re in love, is around her finger. At Diamonds Direct in Charleston, SC they make it affordable and fun to give the gift of sparkle. Whether it’s a Coast Diamond engagement ring for the one you love or the gift of a diamond band for a special occasion, Diamonds Direct Charleston’s kind, and knowledgeable staff is excited to help you find the diamond(s) of her dreams. Just a trip over the Cooper River from Charleston to the Mount Pleasant Town Center brings you to our Coast Diamond Retailer of the Week, Diamonds Direct Charleston. Any time of year is the perfect time to shop for sparkle at Diamonds Direct Charleston. Their Sparkling Winter Wishes Designer Holiday Trunk Show offers you an opportunity for extra savings so you can give a little extra sparkle during the holidays. From on-trend pieces to timeless classics, you will find Coast Diamond sparkle for everyone. A gorgeous Coast Diamond oval halo engagement ring (LC5410-OV) will make her the envy of all her friends this holiday season. The oval center stone is enhanced with radiant diamonds in a prong setting, both around the halo and along the shank of the ring. Ribbons of diamonds rise up to create a glittering halo around the 1.5 CT diamond center stone of your choice from Diamonds Direct Charleston. This unique Coast Diamond halo engagement ring (LC5449) has a contoured diamond wedding band (WC5449) that completes the set beautifully. A girl just can’t have enough diamond bands these days. A trend that keeps its sparkle, well… forever is the Coast pavé diamond band (LC5180H). Stack it with your engagement ring and other diamond bands, as the trend suggests, or wear it alone. Every girl needs a diamond band like this one. Congratulation to Diamonds Direct Charleston for being our Coast Diamond Retailer of the Week! Well, gentlemen, we have arrived at the more detailed part of selecting an engagement ring. We can’t all be experts, but we want to help you go into the jewelry store armed with some thoughts that are important when buying her engagement ring in terms of quality. So here is our third and final installment of The Coast Diamond Men’s Guide to Buying an Engagement Ring: Quality. Preview the engagement ring designers your jeweler features on their website before you visit. You will probably see many designs, from each designer, that have a similar look. When you find a design that you fall in love with, a picture will not tell the tale. You need to see rings with your own eyes and hold them in your hand to see and feel the differences. Some rings simply look brighter and richer. It is not your imagination. Does the ring have a tailored feel? A ring needs adequate metal at the bottom of the shank and throughout the ring without feeling bulky. Are the prongs holding the side diamonds of sufficient thickness to ensure the diamonds are secure? A ring may have small prongs to hold a small diamond, so it is OK if the prongs are smaller, as long as they are in proportion to the stone they are holding. The prongs should not be so bulky that they cover the diamonds. Be sure to ask the jeweler if they offer complimentary cleaning every six months and annual inspections, to assure you that the stones are safe and the ring has not been unintentionally damaged? Remember your engagement ring is not indestructible, so it is incumbent on the bride to take adequate care to ensure her ring does not get damaged. For example… Don’t lift weights or go water skiing, unless she wears special gloves. Ultimately, if you are practical, without losing the excitement of buying an engagement ring, all will go well. Elegant design and superb quality are the hallmarks of a Coast Diamond ring. Consistency in the qualities of old-world craftsmanship has proven to be the standard by which Coast founder and designer, Jay Gilbert, has built Coast’s success upon for 40 years. Quality begins with an elegant design, perfectly engineered by a world-class craftsman. A correctly designed ring enables our expert diamond setters and jewelers to add the finishing touches to ensure the highest quality ring. Our diamond setters and jewelers add the finishing touches to ensure the highest quality. Each Coast Diamond ring, necklace or pair of earrings is set with diamonds that are carefully selected and measured. Our quality diamonds are of SI1 clarity and G/H color. But what does that even mean? The nuts and bolts of diamond quality are the Four Cs: cut, clarity, color and carat. The cut of a diamond is the factor that is most important to the sparkle and all-around appearance of the diamond. The cut grade scale ranges are excellent, very good, good, fair and poor. It is best to choose your preference of cut grade and then move on to clarity. Read more about the cut on the Gemological Institute of America (GIA) )website. Clarity is graded on the absence of unique marks on or within the diamond. There are 11 grades on the clarity scale. According to the GIA website, most diamonds fall into the VS or SI categories. These natural flaws are unique in each diamond. You can choose a diamond center stone where the flaws are hidden, or nearly invisible, in your engagement ring setting. It is extremely rare to find a flawless diamond. The diamonds used in our Coast settings are SI1 quality diamonds. Read more about clarity on the GIA website. The color of a diamond is a less obvious characteristic of a diamond. (Unless you choose a colored diamond like pink or yellow, in which case these diamonds are graded outside of this scale.) Most diamonds are colorless or near colorless. The scale begins with D being colorless. Something to consider… A diamond that is yellow/brown is nice set in yellow gold, but if you are choosing platinum you want a diamond that is colorless to near colorless. Coast’s diamonds are of G/H color. Read more about the color of diamonds on the GIA website. Carat refers to the weight of a diamond. Don’t get that confused with size, because when comparing one-carat diamonds they can be slightly different in size. This is especially true if you are considering different cuts. The one carat (weight) diamond can be different in size, particularly when comparing different cuts of diamonds. Our Coast Diamond rings are commonly designed to fit a one-carat diamond center stone. However, most Coast Diamond rings can be customized to fit the carat (and cut) of your choice. Read more about carat weight on the GIA website. So, which of The Four Cs is most important? Take a minute to read this interesting article we found to help you decide What’s the Most Important C? The personnel at these select stores understand the importance of elegant design and superb quality. They have years of experience helping couples find the perfect engagement ring that will be cherished for a lifetime. Find reviews, reports, directories, listings and even gripes on the BBB. Read reviews on websites such as Yelp, WeddingWire, The Knot and Google. Longevity… If a jewelry store has been around for a while, they probably have a loyal customer base and that only happens for one reason… they take good care of their customers. Dedicated to the science and education of gems and jewelry. A GIA credential is a symbol of knowledge and trust. Focus on consumer protection in the jewelry industry and high expectations in ethical standards. Only 3400 fine jewelers in the world are AGS certified as Registered Jewelers, Certified Gemologists, Certified Gemologist Appraisers, Independent Certified Gemologist Appraisers, Certified Sales Associates and/or Certified Jewelry Arts Professionals. Whew! We hope you have gained a wealth of information for your engagement ring shopping from our series, The Coast Diamond Men’s Guide to Buying an Engagement Ring. You can revisit the other posts in this series at the Style and Value links. It’s Engagement Season! Happy Engagement Ring Shopping! It’s the season of joy and celebration… and proposals! If you are planning a proposal this Engagement Season, we would like to tell you about K & Co. Family Jewelers of Brentwood, CA. Today, Rich & Katrina Neciuk continue the legacy of friendly and personal service and a commitment to honesty that spans three generations at K & Co. Their exceptional inventory ensures you will not only find the “perfect” Coast Diamond ring this Engagement Season but you can also find your loved ones a gift of fine jewelry or a gorgeous watch for the holidays. With so much wonderful in one place you can see why we are thrilled to call K & Co. Family Jewelers of Brentwood, CA our Coast Diamond Retailer of the Week. Rich and Katrina Neciuk, the owners of K & Co. Family Jewelers in Brentwood, CA, are known for their kindness and expertise. The halo engagement ring is a beautiful style often chosen for the way accent diamonds encircle the center stone to enhance its brilliance. This Coast Diamond cushion shaped halo engagement ring (LC10420) is surrounded by 0.47 ctw of fishtail set diamonds on the halo and down the shoulders of the ring. This captivating halo engagement ring design has a polished finish. This Coast Diamond round halo engagement ring (LC5403) is a delicate design. The petite prong set diamonds of 0.15 ctw surround the center stone and decorate the band. It is an elegant ring from our Charisma Collection. The coveted gift for the special woman in your life is a stackable diamond band. Add to her collection of stackables (or help her start one) with this Coast Diamond band (WC5191H). Pavé set diamonds and milgrain edging are details that make this a precious and prized gift. Gift her one of each color: rose, yellow and white gold. We cannot control our excitement for all the #ShowYourCoast brides-to-be. We will be watching out for your posts this Engagement Season. Visit K & Co. Family Jewelers this weekend to find her Coast Diamond engagement ring and all your holiday gift needs. Congratulations to K & Co. Family Jewelers for being our Coast Diamond Retailer of the Week! Welcome back to The Coast Diamond Men’s Guide to Buying an Engagement Ring. (If you missed our first post on engagement ring style you can find it here.) We continue our Men’s Guide this week with the focus on Value. Value is what gives our customer the most confidence in their purchase. You want to stay within your budget while getting the most for your money. However, cheaper does not mean more valuable. So, how do you find the most confidence in your purchase of an engagement ring? We have some important points for you to consider here in our second installment of The Coast Diamond Men’s Guide to Buying an Engagement Ring: Value. There is plenty advice on how much you should spend on her engagement ring: the one-month salary rule, the two-month salary rule, the three-month salary rule (in other words, a quarter of your annual salary). The two-month rule was created behind the idea that how much money you spend on her diamond engagement ring is a reflection of how much you value her. There isn’t a set rule on how much to spend. If you know her style and her expectations and yours, how much you spend is entirely up to you. There are ways to get great value out of your engagement ring so you don’t bust your budget. But how do you do it and still sweep her off her feet when you present her with her engagement ring? Know Your Stuff. Reading The Coast Diamond Men’s Guide to Buying an Engagement Ring is getting you started on the right foot. Before you step into a store to see and feel engagement rings, do your research. The Four Cs are important. We’ll get into to those in our next post on Quality. Discovering her Style, as we learned in the previous post, is vital too. A little knowledge can take you a long way and give you confidence while you are shopping, as well as keep you within budget. We love our partnerships with Coast Authorized Dealers. They are experts in what they do. Get to know a little bit about them before you visit. You can save money by exploring retailers and what they have to offer beforehand. Check their websites for special events, to learn about financing options, promotions or free gifts with purchase. Considering what she values in an engagement ring will mean the world to her for years to come. Her style, the benefits of metal choice, and the shape and size of her diamond center stone are all important when considering what she values. The style of her engagement ring is the essence of who she is. Halo, solitaire, three-stone… there is a lot to consider and that’s why we chose to post our Coast Diamond Men’s Guide to Buying an Engagement Ring: Style first. Discuss metal choice. The value in metal choice often comes from a benefit that is personal (hypo-allergenic, cost, trend, etc.) to your future bride and yourself. Your Coast retailer can help you understand the advantages of the different metals. 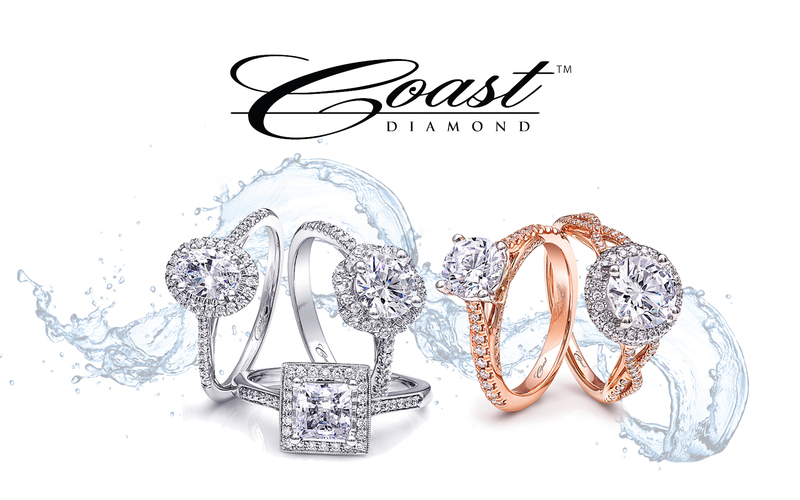 Our Coast Diamond designs are customizable in the metal of your choice, yellow, white, or rose gold, or platinum. Get the details about diamond shape and size. For example, if the diamond size is more important to her than the diamond shape ask to see your options. The same size diamond in a different shape can appear larger. Ask a Coast retailer how you can personalize your Coast Diamond engagement ring with the diamond center stone of your choice. Since 1978, Coast has designed classic and romantic bridal jewelry with the highest standards. Every detail is thoughtfully attended to. The heirloom quality of a Coast Diamond engagement ring naturally lends to value beyond compare. We will finish our series with The Coast Diamond Men’s Guide to Buying an Engagement Ring: Quality. In it, we will discuss standards of quality and The Four Cs of diamond buying.